Lewis Hamilton won the United States GP, in Austin Texas today, ahead of his Mercedes GP team mate Nico Rosberg by 4.5 seconds, and Red Bull driver Daniel Ricciardo in third place - 19.6 seconds behind the winner. The win is Hamilton‘‚ s seventh of the season, and 50th career win. Hamilton now trails Rosberg by 26 points in the drivers standings with three rounds remaining. Sebastian Vettel (43.1s) in the Ferrari finished in fourth, followed by Fernando Alonso (93.9s) in the McLaren-Honda was fifth, Carlos Sainz (96.1s) in the Toro Rosso-Ferrari was sixth, Felipe Massa (1 lap) in the Williams-Mercedes was seventh, Sergio Perez in the Force India-Mercedes was eighth, Jenson Button in the second McLaren was ninth and Romain Grosjean in the US based Haas-Ferrari scored the final point in tenth place. Before the race, the weather was fine, and there was no chance of rain today. Hamilton was on pole, with his Mercedes team mate Rosberg alongside, the Red Bull‘‚ s of Ricciardo and Verstaen were on the second row, the Ferrari‘‚ s of Raikkonen and Vettel were on the third row, Hulkenberg and Bottas were on row four and Massa and Sainz rounded out the top ten. Drivers were expected to get off the ultra-soft tyres as quickly as possible and run two stops with soft compound tyres. There was some talk that the Force India drivers might try a one stop strategy as race time approached. At the start the lights went out and the race began with Hamilton taking the lead Ricciardo in second, followed by Rosberg, Raikkonben, Verstappen and Vettel. Hulkenberg and Bottas touched in the first corner. Bottas then pitted at the end of the first lap for a punctured tyre - Hulkenberg pitting as well. On lap 3 Button attempted to pass Gutierrez but the Mexican fought back for 10th place. Button then passed him later in the lap. Button up to tenth after starting 19th. Hamilto setting fast lap at 1m44.158 seconds. At lap 4 Verstappen sets fast lap at 1m44.132s. On lap 6 Hamilton sets fast lap at 1m43.649s. On lap 7 Grosjean passes his Haas team mate Gutierrez for 11th place. Perez passes Gutierrez for 12th. On lap 9 Ricciardo and Raikkonen both pit, both for soft tyres. On lap 10 Verstappen pits for soft tyres. Rosberg sets fast lap at 1m43.457s. On lap 11 Rosberg pits from second for another set of soft tyres.and rejoins in sixth. Hamilton pits from the lead the next lap for another set of soft tyres.Massa, Sainz and Alonso pit as well. Vettel, yet to stop takes over the lead, doing a good job with the ultra soft tyres. On lap 12 Verstappen sets fast lap at 1m43.093s. Alonso passes Palmer for 13th place. Verstappen goes faster the next lap at 1m43.056s. On lap 15 Vettel pits from the lead switching to soft tyres and rejoins sixth. At lap 15 Hamilton leads Ricciardo by 4.3 seconds, followed by Rosberg (6.3s), Verstappen (7.6s), Raikkonen (9.6s), Vettel (16.1s), Massa (24.8s), Sainz (31.6s), Kvyat (36.7s) and Alonso (38.6s) in tenth place. On lap 16 Gutierrez locks up his brakes and runs wide at the first corner, but continues. Kvyat is handed a stop-go penalty for spinning Perez at the first corner of the race. Verstappen is pushing hard to catch Rosberg in third place. Gutierrez pits and the team looks his car over. Hamilton has extended his lead to 5.1 seconds over Ricciardo. On lap 20 Button passes Kvyat in the final corner for tenth place. Perez now chases Kvyat as well and passes him the next lap. On lap 22 Kvyat pits for the first time for medium compound tyres. On lap 24 Magnussen passes Nasr for 13th. Raikkonen pits for super soft tyres - meaning he will have to stop for an extra pit stop. On lap 26 Ricciardo makes his second stop, switching to medium tyres - he rejoins in fifth. On lap 27 Verstappen pits - the mechanics scramble to get in the pit lane to service the car - a slow stop. After Verstappen tells the team that he is sorry - he thought they called him into the pits. Grosjean abd Button both pit the next lap. On lap 30 Verstappen slows and reports he thinks he has an engine problem. Vettel pits and switches to medium tyres. Verstappen pulls the car off and retires. The virtual safety car is deployed. Sainz and Alonso both pit for medium tyres. 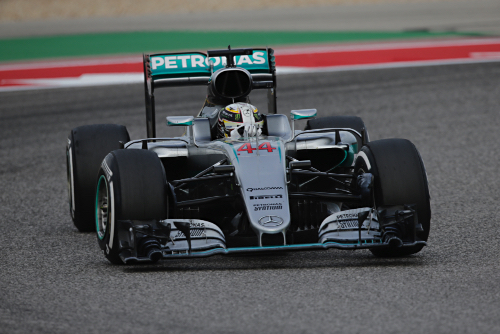 Leader Hamilton and Rosberg both pit and both take on medium tyres. Under the safety car Hamilton leads Rosberg, Ricciardo, Raikkonen, Vettel, Sainz, Massa, Alonso, Perez, and Button in tenth place. Verstappen‘‚ s Red Bull is taken away with a crane. On lap 34 the race was resumed - Hamilton with a 11 second lead over Rosbverg. On lap 35 Palmer chases his team mate Magnussen for 13th place. Vettel has a big moment, the Ferrari sliding around, but continues. On lap 39 Raikkonen pits for soft tyres, then stops on pit exit, the team telling him that one tyre wasn‘‚ t attached correctly. The finn rolls the Ferrari back into the pit exit and retires the car. At lap 40 Hamilton leads Rosbreg by 10.5 seconds, followed by Ricciardo (15.5s), Vettel (26.4s), Sainz (66.6s), Massa (67.8s), Alonso (71.6s), Perez (88.7s_ Button (96.9s) and Grosjean in tenth one lap down. Massa chases Sainz for fifth place, Alonso follows the pair a little further back. Williams is urging the Brazilian to catch Sainz. Rosbverg locks a front tyre, but continues. Ricciardo is running slightly faster laps than Rosberg, but will he catch the Mercedes? On lap 48 Alonso closes on Massa, joining the battle. Kvyat passes Ericsson for 11th place. Magnussen passes his Renault team mate fo 13th place. At lap 50 Hamilton leads Rosberg by 7.9 seconds, followed by Ricciardo (15.1s), Vettel (29.2s), Sainz (78.8s), Massa (79.7s), Alonso (80,5s), Perez (1 lap), Button and Grosjean in tenth place. On lap 52 Alonso makes a move and passes Massa for sixth place. The Williams seems to be losing his grip. The stewards announce they will investigate Alonso‘‚ s pass on Massa after the race. On lap 54 Vettel pits from fourth for another set of tyres - taking on supper softs - coming out in the same position. On the final lap Kvyat is batttling with Magnussen for 11th. Alonso chases Sainz for fifth. Massa suffers a puncture and has to pit. Alonso makes the pass on Sainz and takes fifth place.